It’s not uncommon to want your cake and eat it too. For some, this translates to wanting cereal and having it crunchy too. OK, well maybe that’s a stretch, but the spirit of the statement still stands. After all, it’s simply a matter of wanting a nice bowl of crispy cereal swimming in milk. Even if you have to drink it out of a travel mug. 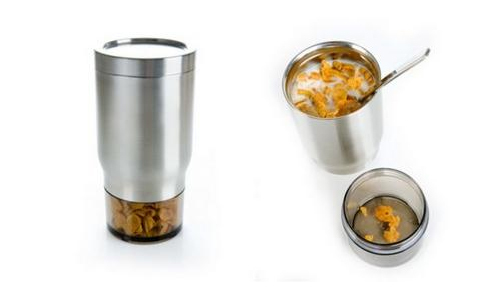 The Fresh Traveller by Arian Brekveld for Royalvkb makes it possible to enjoy crispy cereal and granola with milk, yogurt or whatever you may prefer. (Does anything crispy or crunchy work in orange juice?) Whatever your pleasure, you can now take it with you to enjoy classic combinations whenever, wherever. Of course with a price tag of $49, you may just be better off buying your box of Cap’n Crunch and pint of milk from the corner store.